We noticed a difference right away when started typing on Apple's new third-generation butterfly keyboard. It retains the tactile feel and bounciness we've come to expect from their slim chiclet style typing surfaces, but there is a clear drop in the audio produced. Apple claims the biggest difference is how much quieter it is, and was one of the largest customer complaints. We type on the last generation keyboard daily, and they certainly are loud. However, we aren't so sure that is the change this time around. Under each keycap, is a new silicone membrane, first found by iFixit in their usual teardown. This new seal will help stop the ingress of debris into the sensitive butterfly switch mechanism. That barrier also appears to dampen the audio, making the "quieter" aspect, more of a secondary benefit. With this new seal, these upgraded keyboards should be more reliable, lasting longer than before. This year, Apple has made the jump to quad-core processors for the 13-inch and six-core processors for the 15-inch models. This may be hands-down the biggest reason to update to the latest 2018 MacBook Pros. Even the base model 15-inch pro has the six-core 2.2GHz i7 Intel processor. All of the new models are showing huge improvements in performance over last generation, especially when it comes to the multi-core benchmarks. These are the first Macs to take advantage of the new Bluetooth 5 spec, which shows some huge improvements over Bluetooth 4.2. Bluetooth 5 is able to sacrifice data rate for longer range in low-energy transmissions. A lot longer range. In fact, it can be a maximum of 800 feet, though that is a theoretical maximum in a perfect environment. Real world usage will be lower, but still much more impressive. Additionally, it can power consumption for extra bandwidth. It can actually double the bandwidth, now up to 2Mbps. That means Bluetooth can now go over super long distances with less bandwidth or do twice the data in a shorter range. Of course, you need new hardware to take advantage of this, but we've seen many already starting to hit the market. MacBook Pro's speakers are no slouch. In the 2018 model, they've been upgraded again. Now with a fuller, more developed sound, with noticable improvements in the lower and mid range. They still won't replace a set of dedicated bookshelf speakers, but for most listening, it will be an asset. On the 15-inch MacBook Pros, the base amount of VRAM has been upgraded. Video editors and others will rejoice that now 4GB of VRAM is standard, instead of requiring the extra few hundred dollars as was expected in the past. It may seem like a small thing, but it makes a big difference for professionals. Since we are on the topic of RAM, the maximum capacity for RAM has been increased to allow up to the 32GB rather than 16GB. They also use DDR4 instead of LPDDR3. DDR4 faster, but it is no longer "low power", so it will eat up a bit more battery life. Apple does compensate for that with an increase in overall battery capacity. This shouldn't yield any increase in actual usage time between charges, but it is something we will explore in our reviews to find out for sure. Powering a variety of system functions, including the Touch ID sensor, is Apple's newer T2 chip. This custom chip does many things, and one of them, is allowing for "Hey, Siri" support. This is a first for Mac, which previously required a keystroke to enable. Among all the other changes coming to macOS Mojave, Siri will be even more useful, adding support for HomeKit. True Tone is Apple's display software technology that utilizes two ambient light sensors embedded within the display of MacBook Pro to change the temperature (or white balance) of the display to match the environment it is in. It works not only with the built-in display, but select other displays such as the LG Ultra Fine 4K and 5K monitors, though it does require the lid to be open. We've been fans of True Tone for years, back when it first launched with the 9.7-inch iPad Pro. When you stare at your computer monitor all day, it can make a big difference on the eyes. On the previous generation 13-inch MacBook Pro, it delivered PCI Express bandwidth, and thereby lower throughput, to two of its four ports. Specifically, the two ports on the right-hand side offered full Thunderbolt 3 capabilities, but lower speeds. Now that the 2018 13-inch MacBook Pros with Touch Bar have quad-core processors, the CPU has more lanes and thus supports more bandwidth, allowing all four Thunderbolt 3 ports to be full speed. Pros will rejoice about this, especially those looking for a more compact solution without sacrificing speeds. Apple authorized reseller Adorama is currently offering AI readers $50 off Apple's 2018 15-inch MacBook Pro with Touch Bar with coupon code APINSIDER (see the activation instructions below). Shipping is also free, and Adorama will not collect sales tax on orders shipped outside New York and New Jersey. For many shoppers, this can equate to an additional $190 to $535 in savings on top of the coupon discount. These are the exact same systems carried by the Apple Store and include Apple's standard 1-year limited warranty, just with additional savings. Select models are shipping now, while upgraded configurations are expected to ship out within one to two weeks. To activate the discount, you must use this shopping link and enter coupon code APINSIDER during checkout in the same browsing session (look for a link that says "Do you have a gift card or promo code?" next to the gift icon and click that to bring up a coupon code field). Need help? Send us a note at [email protected] and we will do our best to assist. For up-to-date prices and availability, please check out our 2018 13-inch MacBook Pro with Touch Bar and 15-inch MacBook Pro Price Guides. Only on the 15-inch MacBook Pro. The maximum for the 13-inch is 16GB. Again, only the 15-inch MacBook Pro has gained DDR4 RAM. The 13-inch is still on LPDDR3. AI: question: with the new iTunes 12.8, can these new MBPs stream iTunes titles in UHD/4K? Glad to finally hear about the TB lanes on the 13". Have been wondering that since the announcement, and Apple seemed to say nothing about it. I expected it had all lanes available, but no-one was mentioning it, so I was suspicious. As with any recent Apple product, CHEAP AT HALF THE PRICE. The article didn't mention the heavy thermal throttling feature to assist in making the user a more patient person. I have a 2012 MBPr and I am having difficulty deciding to upgrade since what I have is still fast and can run iTunes, Ashlar Vellum, Parallels, Windows 10 Pro, CAD, and Photos with everything running at once. Maybe wait one more year. Do you consider that a top 9 feature? At the end, the video asked if there were any features that they missed? Well, yeh -- the 2 most important ones! Not many people buy a Mac because of its hardware because the hardware is pretty much just off the shelf components that any computer assembler can match or, given a few months, beat. Most people buy a Mac because its Apple -- which means an integrated product bringing together superior hardware, software and ecosystem. Really, all the hardware has to do is get out of the way and don't give anybody a reason to NOT buy a Mac. That isn't to meant to trash this or any other review. It's hard to talk about the kind of integration that makes these great products because its far more nebulous than processor speed or Gigs of memory. The 2018 MacBook Pros are a nice incremental, sustaining update over their predecessors. The lack of a splashy announcement during a keynote confirms that Apple isn't making a big deal about these. Maybe in a year or two we'll see a major redesign that takes the product line in a new direction. Until then, the 2018 models will keep quietly clicking along and filling the gap. That's right, it's a good mid-cycle update, lots of little improvements and refinements all over the place. The latest MacBook keyboards are quieter and probably more reliable - but they still lack sufficient TRAVEL to type comfortably on. In justifying these ultra shallow keyboards, it is amazing how often I read comments like ‘you adapt to them eventually’ or ‘they are not as bad as many people make out’ or ‘they become easier if you persevere with them’. The contrast with the older MacBook keyboards is stark. People actually enjoyed using them - they made typing a pleasurable experience. We didn’t have to ‘adapt’ to them because they worked so well. I sincerely hope that Apple increases the amount of travel in the fourth generate keyboard. The whole ergonomics of laptops are pretty bad if you're using them all day. Hunched over, peering down at the screen instead of shoulders back, monitor at eye level. The fact that the keyboard gets uncomfortable after a while is probably the least of your worries. The MacBooks have gone ultra thin, light and spartan. And, in doing so they pigeon holed themselves into a niche market that values thin and light (portability) over functionality and incurred a number of compromises that many simply don't want to have to deal with. In addition, they have priced many potential MacBook users into cheaper, but more functional Windows machines. I look forward to Apple putting out a new line of MacBooks targeted at the Mom & Pop user who just wants "a laptop". Or, another possibility is to give their 2018 iPad a cursor and let it fulfill its promise as a laptop killer. Or, preferably, they'll do both. I think you over-estimate what specs mean to Mom and Pop. The MacBook is that machine. -- My social worker friends have trouble understanding what an SSD does. -- Apple OS's tend to be, for various reasons, more efficient than their competitors, so Apple hardware doesn't need to be as powerful spec wise as that of the competition. Perhaps my trouble is that I value functionality over portability while Apple seemingly does the opposite -- and that colors my thinking. 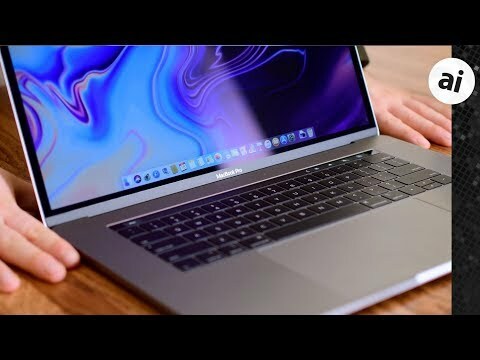 But, I am hopeful that these quiet updates to the high end MBP line were made in order to keep the -Pro line distinguished from the consumer grade laptops and wanna-be's which I suspect will soon see some major redesign & upgrades.